Mikhail Gorbachev has come a long way since he wrote in a high school essay, “Stalin is our glorious fighter, Stalin is the iron of our youth (“Stalin – nasha slava boevaia, Stalin – nashei iunosti polet)” But his love for Stalin faded with Khrushchev’s ‘Secret Speech.” Also gone are the days when he tried to reform the Soviet system with glasnost and perestroika. Gorby as reformer is a nice legacy. But Gorby the fashion model? Yes. The New York Times tells us that along with several other celebrities, Gorbachev will be featured in Louis Vuitton ads. [W]hat is a reader to make of a Vuitton ad, coming in the big September books, that stars Mikhail S. Gorbachev, the last president of the Soviet Union? A decade ago, Mr. Gorbachev’s appearance in a Pizza Hut commercial was generally greeted as a low point in his career. The Vuitton ad, however, is part of a campaign to emphasize the company’s heritage in luggage and travel accessories. 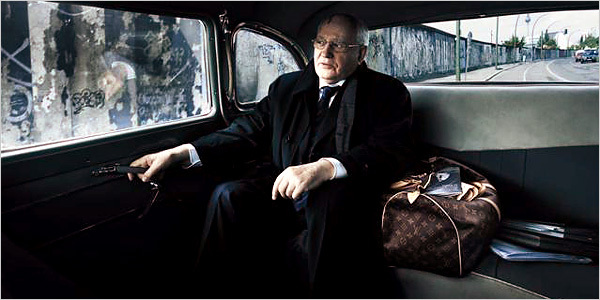 Photographed by Annie Leibovitz, the ads include other celebrities using Vuitton bags: Andre Agassi and Steffi Graf cuddling in a hotel room, their bags not yet unpacked; Catherine Deneuve resting on a trunk in front of a steaming locomotive; and Mr. Gorbachev in the back of a car with a duffel bag on the seat next to him. Of the group, Mr. Gorbachev appears the least comfortable. He is holding on to a door handle, as if the bag contained polonium 210. It seems unlikely he will be approached by L’Or?al. Ha. Ha. Polonium 210. I get it. But Gorbachev does seem uncomfortable. I don’t think its the bag though. He’s holding on to that car handle as if the driver is zipping around that turn. It is a good photo though. Very Cold Warish. Dark and cold. Like he’s going to meet with some KGB types.